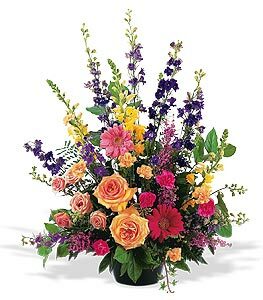 This outstanding arrangement of vibrant seasonal flowers offers your condolences in a most memorable way. A mixture of hot pink gerberas, peach carnations and spray roses, purple larkspur and yellow snapdragons in a green jardiniere. Page loaded in 0.4947 seconds.